Beloved wife, mother, sister and grandma, Marilyn Lynette Duckwall went to sing in the Heavenly Choir on February 4, 2018 at Via Christi Village, Ponca City, Oklahoma after a long, hard fought battle, with diabetes and cancer. Her family was at her side. Marilyn was born in the home of her grandparents Dellas and Belle Sadler in Stillwater, Oklahoma on March 2, 1941. She was raised in the Stillwater area with her sisters Hazel (Butch), Faye and Joan. After high school she took a correspondence class to be an airline stewardess. She gave that up when she started dating R.J. after she asked him to hold her class ring while they were painting, and he wouldn’t give it back until she went on a date with him. That led to her marrying her husband of 57 years RJ (Robert James) Duckwall on June 3rd 1960 at First Church of the Nazarene in Stillwater, Oklahoma with the Reverend Carl Powers performing the service and lifelong friends Johnny and Barbara Caldwell in attendance. She gave birth to her first child, Bob in Aug of 1961 and then Ron in Oct of 1963, both in Stillwater. Marilyn was very active as she spent most of her married life as a homemaker while being a Cub Scout Den Mother for her boys and there were many kids that were always around the house. Marilyn and RJ were Youth Group leaders at Stillwater First Church of the Nazarene for some years after they were first married and though they weren’t much older than the teens they led, the kids loved them. She also was a Weight Watchers lecturer, member of Extension Homemakers and Mothers Club. She enjoyed singing in the choir and singing solos in church. She was very proud that she got to sing in a production of The Sound of Music at The Poncan Theatre. 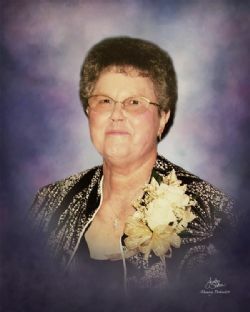 Marilyn was a driving force at Saint Lukes Church of the Nazarene for many years in various areas. She was VBS director, Mission’s leader, Sunday School Board and Church Board member. Until recently, she coordinated funeral meals from home. Marilyn was proud of her Christian faith and strove to be her best to be a fine example to the people around her. In the spring of 1976 the family moved to Ponca City, Oklahoma. There they joined St. Luke’s Nazarene Church and helped with the building of a new Sanctuary and later with the building of the Family Life Center. Marilyn was very artistic and enjoyed painting, ceramics, crocheting, needlepoint, reading books and sewing. She was also a very good cook. In later years, after R.J. retired, they enjoy traveling. They had many wondrous adventures together, including Alaska and Hawaii. Many times Marilyn’s sister Butch would join them on their adventures like when they took their motor home around the northern part of the country for a few months and visited many Historical sites along the way. Marilyn is survived by her husband, R.J. Duckwall of the home. Her sons and their wives, Robert Allen (Bob) and Debby Duckwall of Ponca City, Oklahoma. Ronald LeRoy (Ron) and Ginger Duckwall of Sellersville, Pennsylvania. Grandchildren Joshua Duckwall, Ponca City, Rebekah (Becky) and Tyler Harman , Los Angeles, California, Grant Duckwall and fiancé Hanna , War Acres, Okla., Jennifer (Jenny) and Bryan Willard, Sherwood, Arkansas, Mitch Duckwall, Sellersville, Pennsylvania. Sisters, Faye and Ivan Ramsey, Bethany,Oklahoma, Hazel (Butch) Edmondson, Perkins, Oklahoma and Joan Wikoff, Oklahoma City, Oklahoma., and many nieces and nephews. Marilyn was preceded in death by her fraternal grandparents Dalles Dunleavy and Anna Belle Sadler, paternal grandparents William Edward and Hazel Alice Carmichael, Parents William LeRoy (Roy) and Alma Elizabeth Carmichael, brother-in-law Max Edmonson and nephew Scott Ramsey. Viewing will be at Grace Memorial Chapel 2016 N. 14th, Ponca City, Oklahoma on February 7th and 8th from 8:00 a.m. until 8:00 p.m.
Pastor David Frees will lead a celebration of Marilyn’s life at St. Luke’s Church of the Nazarene 1715 E. Prospect, Ponca City, Oklahoma on Friday, February 9, 2018 at 2:00 p.m..
Internment will follow at Resthaven Memorial Park Mausoleum under the Direction of Grace Memorial Chapel. The family asks that in lieu of flowers donations be made to St. Luke’s Church of the Nazarene in Marilyn’s name.